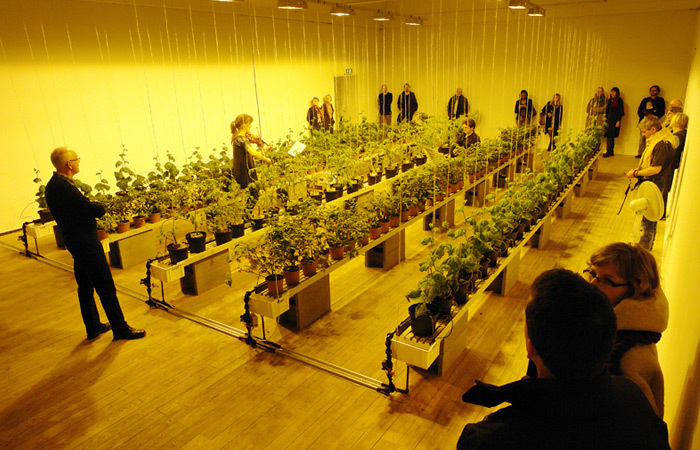 Images: Music for Vegetables performed for 200 Cucumber-, chili- and tomato plants at Aarhus Contemporary Art Centre, Denmark at the opening of the exhibition: Growing Vegetables On a Coral Island. 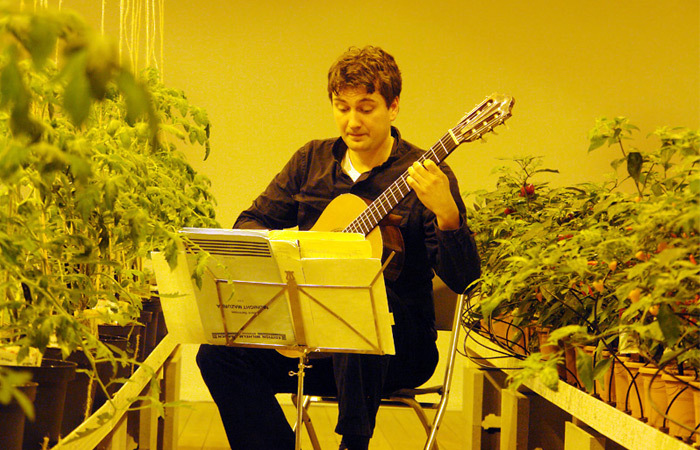 Music performed by Mina Luka Fred, Bratsche & Frederik Munk Larsen, Guitar. Scientific research has shown that plants react positively to classical music such as Mozart in particular by improved growth and increased fruit production. It seems to be the vibration of the water in the plant cells where the change can be measured. Humans also contain a lot of water in our cells like plants, which is probably why we also enjoy music and it makes us feel good. During my years as a tropical vegetable farmer on a small coral island in Maldives in the Indian Ocean (2002-04), I developed this idea as a performance piece, after studying a lot on experimental research with plants. 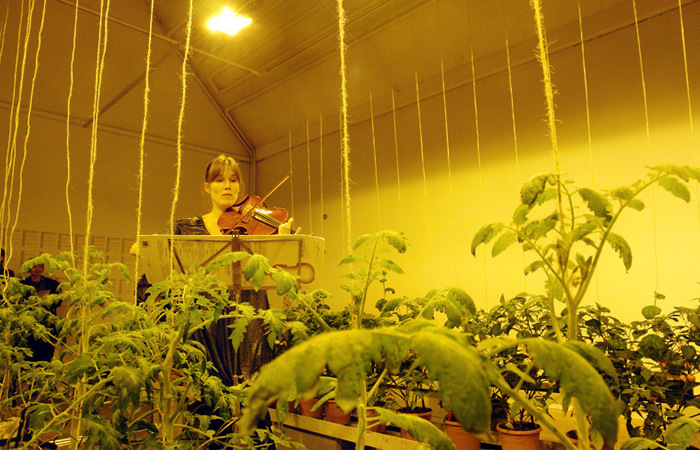 Music for Vegetables is a beautiful situation with the classical musicians playing between the tomato and cucumber plants and has since been performed in other versions in Bernstoffparken North of Copenhagen as part of New Garden City at Tranen exhibition center and at the Emergent Ecologies – Oceanic Performance Biennale in Auckland New Zealand both in 2013. This fascinating article titled The Intelligent Plant by Michael Pollan published in The New Yorker has much more information on experimental plant research. Music for Trees performed at BLOOM Nature, Science, and Arts Festival in Copenhagen, Denmark May 27th, 2017. Musicians: Samira Dayyani (cello) and Adam Simonsen (clarinet) performed a duet composed by Beethoven for the beautiful old oak trees.